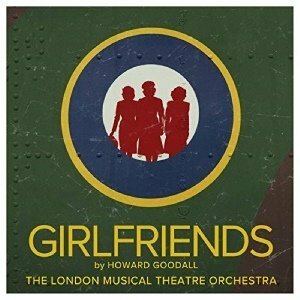 I went along to this concert version of Girlfriends towards the end of 2018 and I must confess I wasn’t exactly blown away – the actors were in fine form, but it felt to me as though this fairly subtle musical would have been better played by a chamber orchestra rather than a full one, and I was most grateful for the spoken narration, by Group Captain Victoria Gosling OBE. Without the visuals and nuances of a fully staged production, I found myself heavily reliant on the descriptions to place the storyline in context. It is somewhat regrettable that the narration didn’t make it on to the album. Listening to this recording, however, the music is really quite beautiful and majestic. Yes, it’s repetitive in places, inasmuch as the same melodies keep coming back, which is slightly bizarre for a storyline in which no two days are the same, but this is outweighed by the plot sitting rather well with the current increasing emergence of stories about women on stage. In a nutshell, it tells the story of what women recruits during the Second World War went through on an RAF base. It was written a generation ago, however, and it shows: despite a female-majority cast, very few musical numbers pass the Bechdel test. There was the odd lyric that I chortled at in the comfort of my front room. It’s good for lyrics to rhyme, but lines like, “Left my useless job / Left my boyfriend Bob” felt a bit contrived – rhyme over substance, if you please, especially when a word is rhymed with itself: “The Nazis raid us / Think they’ll invade us”. Elsewhere, mind you, the lyrics are closer to the sublime than the ridiculous: “Once the men thought us unusual / Now, we’re just as vital too / Once they gave us all the easy jobs / Now, there’s not much we don’t do”. I felt I had more of an understanding of what was going on from listening to the album than by sitting in the Great Hall of the Bishopsgate Institute, trying to make sense of it all, watching people singing away and an entire orchestra going for it (albeit with LMTO’s usual skill and professionalism). The quality of the audio recordings does both actors and orchestra justice, and then some, striking the right balance to ensure the orchestrations never overpower the voices, or vice versa. This may seem basic, but it’s extraordinary how many recordings even in this day and age fail to get it absolutely perfect. It’s very much an ensemble piece of theatre, with solo musical numbers relatively rare (looking at the track listings, there are just two, both in the first act). More often than not there are multi-part harmonies abound, to the point where they are a little overused. Many of the musical numbers drive the story forward, often steadily. Occasionally it feels as though the musical is taking the scenic route to get to the point, but there’s a journey to be enjoyed in, for instance, discovering what it is about Guy (Rob Houchen) that makes quite so many ladies interested (to put it mildly) in him. There’s sufficient variation in tempo, sometimes within the same musical number let alone across the musical as a whole, with moments of fear and tension captured as brilliantly as moments of relative bliss. With such a talented cast, it’s difficult to single out stand-out performances. But the ones that stick in my mind are Bronté Barbé’s rendering of ‘The Chances Are’, a heartfelt number about the sitting and hoping that goes on when one’s partner is out to war, and Rob Houchen’s tenor voice is perfectly suited to the soaring melodies in this musical. It’s not often that a new recording of a musical with an orchestra as large as the LMTO is released these days. Rather longer than most cast recordings, coming in at just under two hours, this is set to be the go-to album for Girlfriends, a hearty and passionate listening experience. The album features an all-star cast, led by Lucie Jones as Lou (Legally Blonde, UK Eurovision Entrant 2017, Les Misérables) and Lauren Samuels as Amy (Bend It Like Beckham, Romantics Anonymous, We Will Rock You). They are joined by Bronté Barbé as Jane (Beautiful / Shrek UK Tour), Natasha Barnes as Sally (Funny Girl / Mack & Mabel), Vikki Stone as Jasmine (The Now Show / Lyric Hammersmith’s Aladdin and Jack & The Beanstalk) and Rob Houchen as Guy (Candide / Les Misérables). 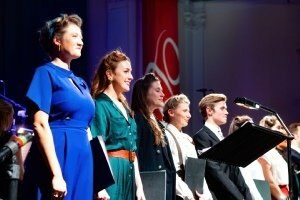 The cast is completed by Chris McGuigan, Lizzie Wofford, Lisa Bridge, Charlotte Clitherow, and Tara Divina. The 2018 concert was directed by Bronagh Lagan. Girlfriends was first performed at the Oldham Coliseum in May 1986. 1. OPENING – FIRST DAY – JUMP!